Four of Pentacles Tarot Card. The True Interpretation. The Four of Pentacles Tarot card is one of the number cards in the suit of Pentacles in the Tarot. This card is one of the Minor Arcana cards. The Pentacles are also known as discs or Coins in different Tarot decks. The suit of Pentacles is connected with practicality, security and material goods. It belongs to the element of Earth, the colour green, the season of winter, the direction of north and the timing of midnight. The astrological corresponding sun signs are Taurus, Virgo and Capricorn. 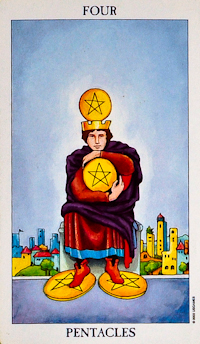 The key words connected with the suit of Pentacles include caution, competence, dependability, determination, enterprise, generosity, hard work, practicality, reliability responsibility, support and trust. The Four of Pentacles Tarot card meaning usually is a reminder to count ones blessings and focus less on material wealth and more on the closeness of loved ones. The 4 of Pentacles can be both a positive and negative card in Tarot Readings and shows that although being in a position of experiencing good health, good fortune and a good career it is not enough and no pleasure is forthcoming. This card is traditionally known as the Miser card and gives the lesson that although he has plenty of money, he has no friends, no interests other than money and some would say no worthwhile life. When the Four of Pentacles appears in Tarot Readings concerned with love and romance it usually indicates holding onto a broken relationship or the hope of a relationship for too long. This card prompts realistic and practical action to fix the problem. The Tarot card meaning for questions concerning career or business in Tarot Readings often represents discontent and dissatisfaction in a job. It may pay well but does not provide the satisfaction and fulfilment needed to be proud of what you do. This card urges you to look at how you can change this. The Four of Pentacles Tarot card meaning for questions related to money and finance usually relates to overprotection of worldly goods and holding possessions above friendships. Conversely it can also show a compulsion to overspend as a form of emotional compensation. If the 4 of Pentacles is prominent in a Tarot Spread it can show that you may be holding on to material possessions and money too tightly. It can indicate a blockage in emotional self-expression and a reluctance to take a calculated risk or gamble in order to gain. It shows that you may need to sacrifice something in order to achieve more success and fulfilment. This card also can show jealousy and possessiveness – either from or directed at you. 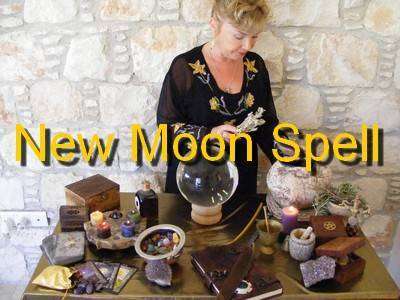 I use Tarot cards from the Suit of Pentacles in my Money Spell casting and for general abundance, prosperity, health and security manifestation.